If I was an advertiser in France, I'd be thinking twice about staying given the results of a study by l'Institut Nielson (Executive Summary) as described in le Figaro today. A total of 25,500 people were questioned on their attitudes to advertising from around the world. The French, whose advertising is the most strictly controlled in the world, declare themselves to be the least affected by its messages. In response to the question 'Is advertising useful? ', 38% - the highest in the world - believe that it is not. Western Europeans, on the whole, are more sceptical of advertising than those in the emerging markets of Latin America, the Middle East, Africa and Asia which is pretty normal as we've been bombarded with the stuff for eons. The point of it all was to find out consumer perceptions towards the benefits of advertising. Most people agree that it's useful in sponsoring sport and culture, and that it helps creates jobs. 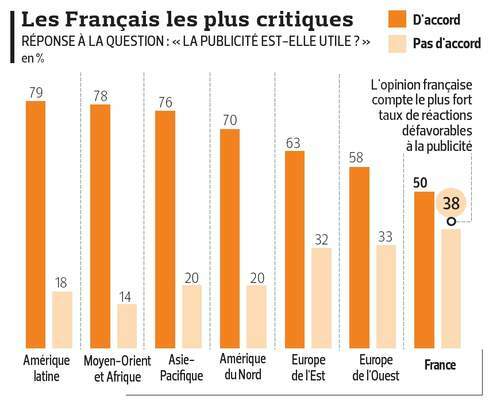 Where the most discrepancy falls is advertising as a source of information, and it's here that the French distinguish themselves with their high negative score. The comments to Le Figaro's article reinforce this negativity, with many people declaring that they don't take any notice of advertising when it comes to choosing what to buy, although many also go on to cite the advertising they fail to take notice of. Several declare that they studiously avoid buying any item where the advertising has pissed them off, and switch television channels when certain loathed ads come on. But don't we all do this? In the UK, the adverts are the time when electricity usage soars as people put the kettle on for a cuppa. People go to the loo during the ads, or put washing away, zap onto other channels to watch some ad-free minutes of something else, load the dishwasher, send their kids to bed or just about anything you do in a free couple of minutes. les français sont tellement prétentieux qu'ils préfèrent dire qu'ils n'aiment pas la pub. Le fait de l'aimer voudrait dire qu'elle serait plus forte qu'eux en ayant une influence sur leurs comportements... ce qui serait totalement inadmissible pour les champions toutes catégories des donneurs de leçons ! Translation: The French are so pretentious that they prefer saying they don't like ads. Saying they do like them would mean that the ads would be stronger than them by having an influence on their behaviour... which would be totally inadmissible for these champions of all categories of lesson-givers". Naturally, the French misunderstood the question about the usefulness of ads, taking it to simply mean those ads designed to sell them Activia rather than Yakult. In fact, ads have been used in many instances to draw attention to societal issues. For the list from the WFA see here. They include Amnesty International, Fondation Abbé Pierre, WWF, Greenpeace, to mention a few. Even Benetton had their 'United Colours of Benetton' ad, plus others which were systematically used to make a social statement as well as sell pullies. Maybe the French restrictions on advertising remove any possibility of carrying out such campaigns which is why they have such a negative attitude towards it. Except Abbé Pierre, natch, who was French and thus allowed access to the tele. La publicité à la télévision, ça s'adresse uniquement aux débiles mentaux. J'le dis parce que si y en a parmi vous, ça s'adresse à eux... Les autres, circulez, y a rien à voir. Allez hop. Personally, advertising drives me nuts. I hate the huge quantity of billboards that make the outskirts of towns so ugly; many ads on French tele are just so bad you wonder how anyone who lives in the same universe as the rest of us could come up with them, and I frequently turn the radio station over when certain ads assail my ears when driving so I don't become a road-enraged danger to all and sundry. However, I love a good, imaginative, clever ad. The "I bet he drinks Carling Black Label" ones are classics, as are the old Heineken and Silk Cut ones. Advertising can be a force for the good, the imaginative, the clever and the informative, but you have to be French not to see it, or have regulations which assume you are totally unable to control yourself. State nannying par excellence, I should write immediately to Our Gordon to tell him of another fabulous opportunity for interfering. But I won't, cos I drink Carling Black Label. I hate it too, and use that time to go to the loo, or put the washing in the machine etc, or smoke! However just from time to time on programmes about ads, there are some really funny ones, often foreign, and a one about english beer makes me laugh a lot, but I cannot remember which beer - so it did not do its' function as an ad, did it!